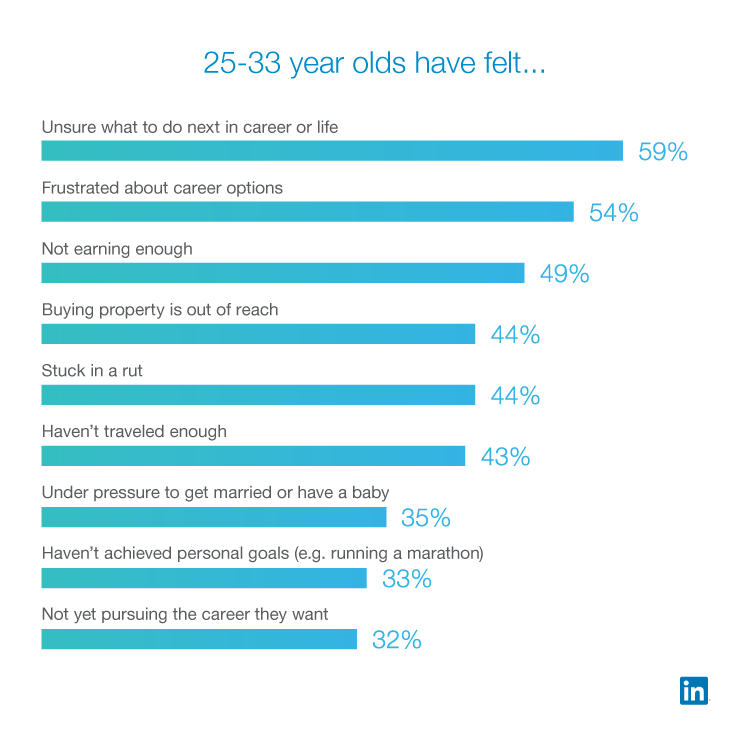 To better understand the quarter-life crisis — that stage in your mid 20s to early 30s where you have felt at a crossroads in your career or life — we surveyed thousands of 25-33 year olds around the world on whether they’ve experienced one and why. This new data shows that 75 percent of 25-33 year olds have experienced a quarter-life crisis, with the average age being 27. While most people have experienced a quarter-life crisis, what exactly is causing this anxiety? Sixty-one percent say finding a job or career they’re passionate about is the number one cause. Another top reason is comparing themselves to their more successful friends. Nearly half (48 percent) say this has caused them anxiety, with women feeling this even more than men (51 percent vs. 41 percent). More than one-third (36 percent) have entirely changed their careers, switching to new industries and different roles. Although career pivoting is prevalent among 25-33 year olds, this may be more of a result of the changing workforce — LinkedIn data shows that job hopping overall has doubled in the last year, and more than two-thirds of job changers have pivoted careers. 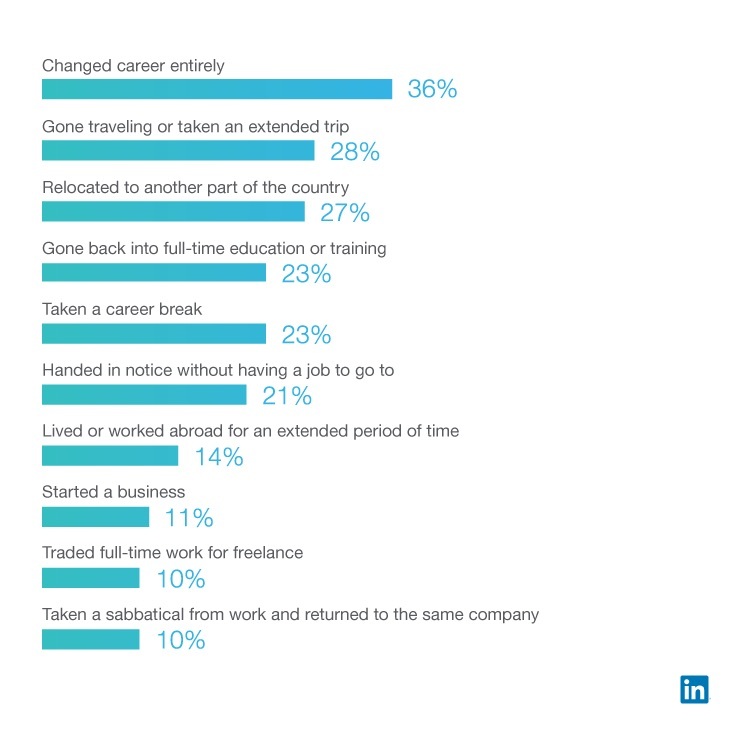 Nearly one-quarter (23 percent) have taken a career break during this period of uncertainty, taking time off from work to reevaluate what they want to do. Although more than one-quarter (28 percent) of 25-33 year olds know what their dream job is, they’re unsure how to approach a career move. On top of that, 56 percent want advice to figure out what’s next, but don’t know where to go for answers. To address this and make it easier for people to connect with one another for lightweight mentorship, we launched a new Career Advice feature that can help. If you’re interested in making a career switch, looking for salary negotiation tips, or need help with work life balance, you can use Career Advice to find professionals on LinkedIn who can help based on what type of advice you need and your interests.